On this date in 1595, Gabriel de Espinosa the “confectioner of Madrigal” was put to death for impersonating the late king of Portugal. Most accessible information about this queer case appears in Spanish, as are most of the links in this post. 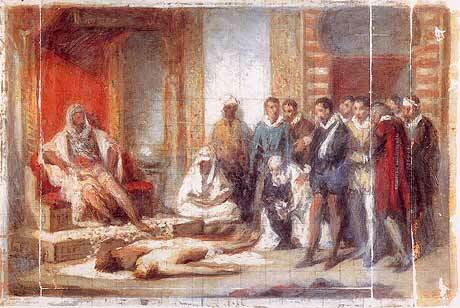 The confectioner’s fall began in Morocco 17 years before, almost to the day. On the fourth of August 1578, the King Sebastian of Portugal — who had no child and no sibling — bravely and foolishly got himself killed crusading against the Moors and set up a succession crisis that enabled neighboring Spain to gobble up the kingdom. As this scenario spawned multiple executions, so we have already dealt with the background in greater detail. Its strange outgrowth was “Sebastianism”, a local variation of the widespread “king under the mountain” myth. Sebastian’s body was not recovered, and Portuguese survivors straggling back home brought confusion and rumor as to his fate. * Since the kingdom itself had followed the young king into occultation, his stunned subjects widely embraced the unlikely fancy that the prince was about to return to put things right. These stories compounded themselves by spawning fresh rumors of the elusive king — deep in penance for losing the battle, some said — said to be sighted here or there like Bigfoot, according to your cousin’s best friend’s groomsman who heard it from a traveler at a roadside inn. Twice in the 1580s, popular superstition elevated to royal pretender two different mystery men. While these affairs had an accidental and ad hoc character, our Gabriel de Espinosa arising in 1594 was diligently contrived. The Augustinian friar Miguel dos Santos, a follower of the exiled clainant to the Portuguese throne,** somehow scrounged up a Spanish pastry-maker with an uncommon felicity in languages† and took him under his wing until he could do a passable impression of the late king. 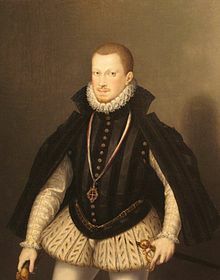 This Gabriel de Espinosa was then to be paired up with a Portuguese dowager princess who had been socked away in a nunnery during the succession mess. This would have been a considerable promotion for both characters, but the process of quietly gathering support for these would-be rulers could not avoid detection. Since it was always about something much more profound than the man himself, it’s no surprise that Sebastianism like other “sleeping king” superstitions very long outlasted the plausible lifespan of its namesake. When Portugal finally regained independence from Spain in 1640, the new King John IV had to promise to surrender his throne should Sebastian reappear: Sebastian would have been 86 years old at the time. The messianic cult even hopped the Atlantic and found a home in Brazil well into the 19th century. * According to Brook, two Portuguese chroniclers did in fact see Sebastian’s body identified by captured Portuguese noblemen after the battle. But the Sebastianism cult had its legs long before such reports filtered back to the homeland. ** It was in service of the this exile’s claim that the Florentine adventurer Philippe Strozzi got killed trying to capture the Azores. † Apparently the baker was a former soldier and had also thereby acquired some skills like horsemanship that also proved handy for feigning nobility.